In Assassin’s Creed: Odyssey, players have been wondering what the locations are as shown by a series of treasure maps offered by the pirate, Xenia. While the maps themselves point to where you can find her treasures, it can be difficult to certain aspects of these maps. There are a total of six treasures to collect by following these maps, and each treasure is its own quest. As such, you’ll need to return to Xenia each and every time you find a treasure. That said, we’ve put together a guide that will help you figure out the locations shown on every treasure map offered by Xenia in Assassin’s Creed: Odyssey! Interact with the pirate Xenia to obtain her treasure maps in Assassin's Creed: Odyssey. 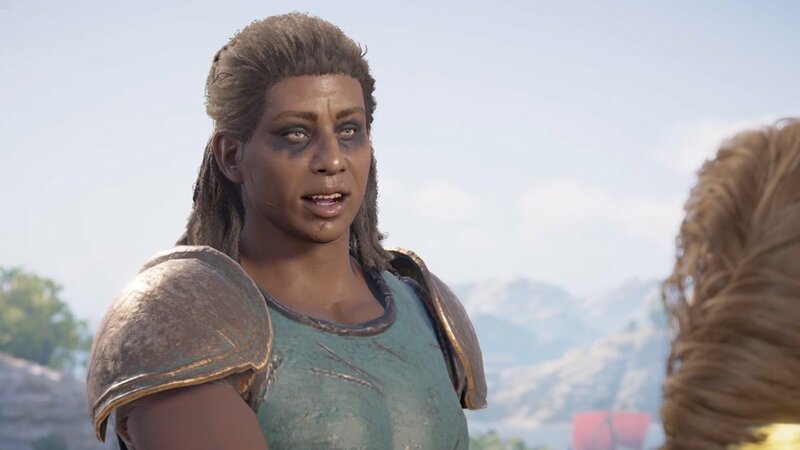 After you find Xenia in Assassin’s Creed: Odyssey, she’ll give you a series of treasure maps that point to the locations of different treasures hidden throughout Ancient Greece. Using these maps, you’ll be able to complete five different quests and find six treasures. To simplify everything, we’ve broken down each quest and treasure map location below! Golden Feather of Ajax: The first map location points you towards the treasure, Golden Feather of Ajax. To complete this quest, also known as Birds of a Feather, you’ll want to head to the island west of Attika. Next, travel to the southern tip of the island and search the Lighthouse of Ajax. After meeting the Lighthouse Keeper, you’ll be sent to clear out some bandits, with one of the bandits having the Golden Feather of Ajax. With the treasure collected, return to Xenia. Macedonian Bracelet: The third map location points you towards the treasure, Macedonian Bracelet. To complete this quest, also known as Sacred Vows, you’ll want to head towards the southern end on the main isle of Attika called Sanctuary of Sounion. Interact with the people there and search boxes to find clues as to the treasure’s location, which is underwater just off the shore. By diving down to the bottom, you’ll be able to collect the Macedonian Bracelet. With the bracelet on hand, return to Xenia. Triton’s Shell of the Tides: The map that shows the Triple Peninsula of Chalkidike can be used to find the treasure, Triton’s Shell of the Tides. To complete this quest, also known as She Who Controls The Seas, you’ll first need head to the leftmost interior peninsula. There, you’ll be able to find the Underwater Cave of Chalkidike. Enter the cave and swim through it to encounter a series of bandits, clear them out and you’ll be able to scan the area for a treasure chest. Inside, you’ll find Triton’s Shell of the Tides. Collect the treasure, then return to Xenia. Pan’s Flute, Apollo’s Lyre: Another map will point you to the location of two treasures, Pan’s Flute and Apollo’s Lyre. To complete the quest, also known as Throw the Dice, you’ll want to start by heading to the Cave of Pan on the east shore of Attika. There, you’ll be able to find Pan’s Flute. Next, head to the east shore of Euboea and enter the Apollo Temple ruins. Inside, you’ll be able to grab Apollo’s Lyre. With these treasures collected, return to Xenia. Old Coffer: The last map will send you out to find a treasure in the form on an old coffer. To complete this quest, also known as Priceless Treasure, you’ll first want to head to Achaia. There, enter Zosimos and find a way into the Great Deceiver’s fort known as Olouros Fortress. Note that it’s recommended you be around Level 50 to explore this area, though if you’ve mastered stealth you can explore at any level. In the fortress, head to the building at the northeast corner. Inside, you’ll find the old coffer. Collect it, then return to Xenia. By finding all of the treasures offered by Xenia, you’ll be able to earn the “Pirate’s Life For Me” achievement, and romance options for Xenia will unlock. It’s a fun series of quests, and if you’re up for a little exploration, we definitely recommend taking the time to complete this one. For a visual guide on Xenia’s treasure maps, be sure to check out the video below courtesy of YouTuber PowerPyx. For more on Assassin’s Creed: Odyssey, be sure to check out some of our previous guides including what Misthios means in Assassin’s Creed: Odyssey, how to use Photo Mode in Assassin’s Creed: Odyssey, and how to unlock fast travel in Assassin’s Creed: Odyssey. By reading through this guide, you should now know the locations of all treasures shown in Xenia’s treasure maps in Assassin’s Creed: Odyssey.